The Crown Liquor Saloon is maybe the most famous pub in all of Northern Ireland, and it is one of few pubs in the world owned by the National Trust (taking care of important sites on behalf of the state). 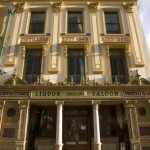 The pub dates back to 1849, and it was known to be one of the most beautiful gin palaces of its time. In 1978 it was bought by the National Trust and since then lots of money has been used on renovating the building and giving it the original Victorian style back. Inside the Crown Liquor Saloon you can see a mosaic of the Crown on the floor as you enter and it has ten booths, so that the important visitors could have some privacy while visiting. If you visit the saloon today you can of course buy yourself a cold bear, or you can combine it with a lunch menu or maybe a dinner (if you come in the evening).